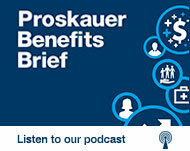 In this episode of The Proskauer Benefits Brief, partners Michael Album and Josh Miller discuss the nuts and bolts on a management buyout, and in particular, the issues and strategies that management needs to know. They examine the structure of a management buyout and discuss in detail the process behind the buy-out and how it unfolds for management. Be sure to tune in and listen for the latest insights and perspective on management buyouts in this first of a seven part series. Mike Album: Hello. Welcome to the Proskauer Benefits Brief – Nuts and Bolts on a Management Buyout, what management needs to know. I’m Mike Album and on today’s episode I’m joined by Josh Miller and we’re going to discuss the nuts and bolts of a management buyout, and in particular, what management needs to know. Josh, why don’t we start at the beginning and you can tell us a little bit about the structure of a management buyout. Josh Miller: Sure. Thanks, Mike. A management buyout is a transaction where a financial sponsor, a private equity firm, together with the company’s management team, purchases the assets and operations of the business that they manage. An MBO is typically financed through a combination of debt and equity derived from the buyers, lenders, and management roll over as an after-tax investment. In an MBO the assets of the target are leveraged, but there is equity, and the management team is expected to rollover a portion of their existing equity, tax free where possible, as part of the transaction. Notably the LBO/MBO market is extremely hot right now. We’re on pace for the busiest year by dollar since 2007 according to Dealogic. Mike Album: So in addition to excessive fee claims you also mentioned claims alleging underperformance of investment funds. It seems like these claims would often go hand in hand with excessive fee claims because an investment is more likely to be challenged if its performance appears not to justify the fees being charged. Josh Miller: Sure, and that’s exactly right. Management wears multiple hats in these types of transactions. The key players in an MBO are as you mentioned are the seller, the company and its private equity sponsor or strategic owner. Then you have the buyer, a new private equity firm investing. Or it might be a strategic acquirer. And you have the senior management team, and we’ll talk a little bit later in one of the other podcast series about who exactly who the management team should be and how that’s determined. And you also have a lot of other players in the deal. You have the investment bankers and other financial advisers, the lenders and creditors, and each of those parties tends to have its own law firm, accounting firms, and outside consultants. Mike Album: Josh, I think at this point we all should acknowledge that management is in a unique position because it wants to work with the selling PE firm to maximize the profits on the deal, in which management will also participate. At the same time it wants to negotiate a very acceptable and perhaps aggressive new arrangement with the buyer because they’ll be running the company going forward and they want to realize more profits if this happens again. So what has been your experience with how management fights through the stresses and strains of dealing with these multiple parties? Have you seen management be successful in this kind of situation? Josh Miller: Absolutely. Management can be very successful. It’s a careful navigation of those issues, but particularly with good counsel, both in connection with the sale on behalf of the company as well as counsel of management individually, they are able to navigate those issues, often very successfully. Mike Album: Josh and I have done a lot of these. The way we can help the management team, frankly, is as a sounding board to run through various scenarios with them and also various possibilities so we can use our experience to help guide them about when to raise issues, how to raise issues, and how to work both on the seller’s side as well as the buyer’s side to reach a successful result.So there are legal issues and psychological, emotional, personal issues that go into building management team strategy to be a success. So, Josh, why don’t we talk a little bit about how an MBO comes about? Josh Miller: It’s important to think about the rationale for the transaction from the various players’ perspectives. Certainly the existing private equity sponsor might be winding down funds. They might find the public markets to be unfavorable. Maybe the MBO came out of an abandoned initial public offering process. And there might be a lot of industry consolidation where consolidation really is necessary as a means to compete with other peer groups. It might be a way to establish a platform for growth and to pivot in other industries or expand geographic footprints. In other cases, particularly over the last few years, the multiples and the sale prices might be so good that a selling sponsor just can’t refuse a transaction and will exit earlier than anticipated. Mike Album: That’s right. And we should also add that while another PE firm may be a financial buyer, you could have a situation where a company is being acquired by a strategic buyer and that would raise a host of other concerns because the management team going into a strategic buyer, in other words another operating company and not a PE firm, would be faced with a lot of different challenges that would also have to be addressed. So I think the next step we want to do is talk a little bit about the terms and process of how an MBO starts to flow and that will be in our next podcast. Josh Miller: Thank you for joining us on the Proskauer Benefits Brief. Stayed tuned for more insights, the latest hot topics in management buyouts, and executive compensation. Be sure to follow us on iTunes.